Teachers carried placards as they walked a picket line outside South High School in Denver early Monday. DENVER — Striking Denver teachers wearing red packed a library meeting room Tuesday for a public negotiating session with district leaders on the second day of a strike over pay. The meeting, facilitated by a federal mediator, was the first time the sides met since talks broke down over the weekend. Red is the color teachers in states across the country have donned in the past year amid similar strikes and protests for better pay and working conditions. All schools remained open and staffed by administrators, substitutes, and teachers not participating in the strike. At the start of the talks, Superintendent Susana Cordova acknowledged that students were not getting the kind of instruction they normally would and said she was committed to reaching a deal to end the strike. 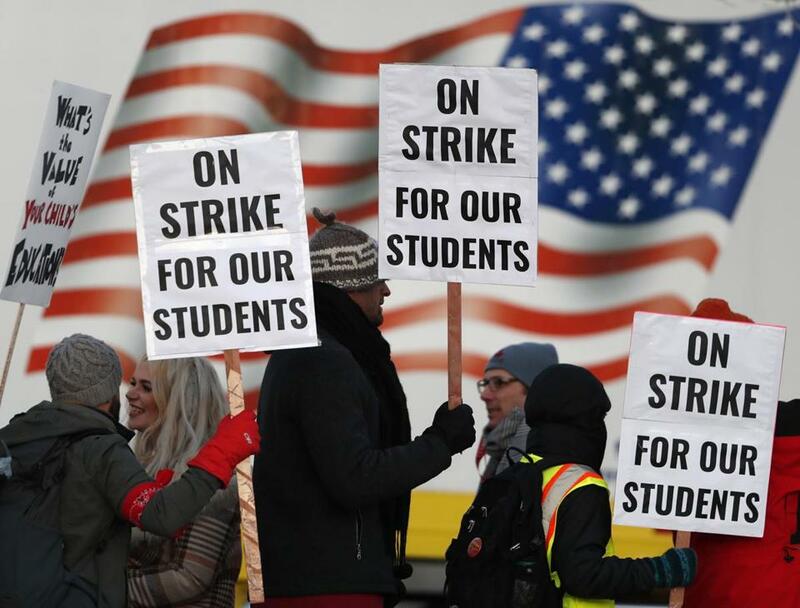 Preliminary reports from the school district indicate 58 percent of teachers did not report to work on Tuesday, slightly more than on the first day of the strike Monday. The walkout came about a year after West Virginia teachers launched the national ‘‘Red4Ed’’ movement with a nine-day strike in which they won 5 percent pay raises. Most recently, Los Angeles teachers held a six-day strike last month. There are 71,000 students in district-run schools. Another 21,000 are enrolled in charter schools unaffected by the strike. Lily Eskelsen Garcia, president of the National Education Association, told a crowd of picketing teachers outside the state Capitol on Monday that theirs was the latest in a national movement to provide just compensation to educators. The dispute is over the school district’s incentive-based pay system. The district gives bonuses ranging from $1,500 to $3,000 a year to teachers who work in schools with students from low-income families, in schools that are designated high priority, or in positions that are considered hard to staff, such as special education or speech language pathology. The union is pushing to lower or eliminate some of those bonuses to free up more money that would be added to overall teacher pay. The district sees the disputed bonuses as key to boosting the academic performance of poor and minority students. Kimberly Beckeman, a ceramics and sculpture teacher at South High School, said she cried when the union announced teachers would go ahead and strike after 15 months of negotiations. She said she did not want to leave her students, but it was time to act. ‘‘It’s what’s right. It’s not ideal. I don’t want to be out here,’’ she said on a picket line outside the school Monday. Teachers say the reliance on bonuses leads to high turnover, which they say hurts students, and that spending money on smaller class sizes and adding support staff, like counselors, is the best way to help disadvantaged students. The district has proposed raising starting teacher pay from $43,255 to $45,500 a year. That’s $300 a year less than the union’s proposal, which would add $50 million a year to teacher base pay, according to union officials.